This courtyard building features a beautifully landscaped courtyard and offers residents an easy walk to the Green Line, grocery and farmer’s market as well as the pool, softball fields and ice rink at Ridgeland Common. This lovely building a few blocks from the Green Line and Metra features new kitchens and tenant-controlled air conditioning and heating. This building at 105 S. Taylor is right across from the Green Line. 1158-1164 1/2 S. Oak Park Ave.
With a bus stop right out front, the Blue Line a few blocks away and a bike shop around the corner, getting about from this gorgeous courtyard building is easy. Residents are a half-block from the tennis courts of Euclid Square Park and a block away from the cozy restaurants and intimate music venues of the Roosevelt district. This building is close two nearby parks and a few steps from the bus stop. This gorgeous courtyard building with Arts and Crafts details is one block from the Green Line, two blocks from the grocery and across the street from Ridgeland Common and the Oak Park Farmer’s Market. The red-brick facade and unique projecting cornice of this early 1900s building have been meticulously maintained and its interior has been carefully updated. Residents have an easy walk to the Green Line, grocery and farmer’s market as well as the pool, softball fields and ice rink at Ridgeland Common. This pretty building has a spacious yard and a location that makes for a convenient commute downtown on the North Avenue bus or the Austin bus that connects with the Green line. 159-171 S. Oak Park Ave. The studios in this building are a block from the Green Line and the many delicious restaurants of Oak Park Avenue. Just beyond are Scoville Park, with its tennis courts and summer concert series, the Oak Park Public Library and the Frank Lloyd Wright Historic District. This two-flat features two large two-bedroom apartments, basement storage, free laundry, a back yard and off-street parking. It’s a few blocks from the Green Line and the Dole Branch of the Oak Park Public Library. The whimsical gargoyles adorning this beautiful Tudor-revival building designed by renowned architect E. E. Roberts lend it a unique elegance. The red-brick facade and unique projecting cornice of this early 1900s building have been meticulously maintained and its interior has been carefully updated. Residents have an easy walk to the Green Line, grocery and farmers’ market as well as the pool, softball fields and ice rink at Ridgeland Common. This building features a spacious courtyard and is just three blocks from the Green Line and less than a mile from the I-290 Expressway. This classic brick two-flat has a fenced-in backyard and is an easy walk from the Green Line, grocery and tennis and basketball courts at Longfellow Park. This fine building is just a short walk from the Green Line and Metra. Residents can step outside and enjoy the cozy restaurants of Marion Street, play frisbee in Mills Park or see a summertime silent film on the porch of the historic Pleasant Home. This attractive courtyard building is three short blocks from the Green Line, two from the tennis courts at Scoville Park and in the heart of one of the prettiest parts of town. This lovely courtyard building is three blocks from the Green Line and grocery and across the street from Percy Julian Middle School. This cozy four-flat is across from Columbus park, a beautiful green space designed by famous landscape architect Jens Jensen, and two blocks from the galleries and cafes of the Oak Park Arts district. The Blue Line and I-290 Expressway are less than three blocks away. This six-flat, built in 1919, is one block south of the Green Line. This building was built in 1969 and contains a mix of studio and one-bedroom apartments. It’s nestled between downtown Oak Park and downtown Forest Park and is a quick walk from the Metra, Green Line and groceries. This beautiful courtyard building was built around 1930 and is a Cavalcade of Pride award winner. The Line 91 bus stops in front of the building and the Green Line is about five blocks away. These remodeled California-style one-bedroom apartments are close to the I-290 Expressway, Green Line and bus routes. This historic building features a beautifully landscaped courtyard and apartments with central air and laundry. The Green Line and farmer’s market are a few blocks away. White bricks and terracotta accents along with the wrought iron entry arch to its lovely courtyard set this building apart. The Green Line and Longfellow park are a short walk away. This building at 421 S. Lombard is a few blocks from the Green Line. This distinctive courtyard building is also home to Oak Park Apartments. The Green Line and grocery are just a few blocks away. This beautiful courtyard building is just a block from the Green Line, two from Stevenson Park and three from the grocery. 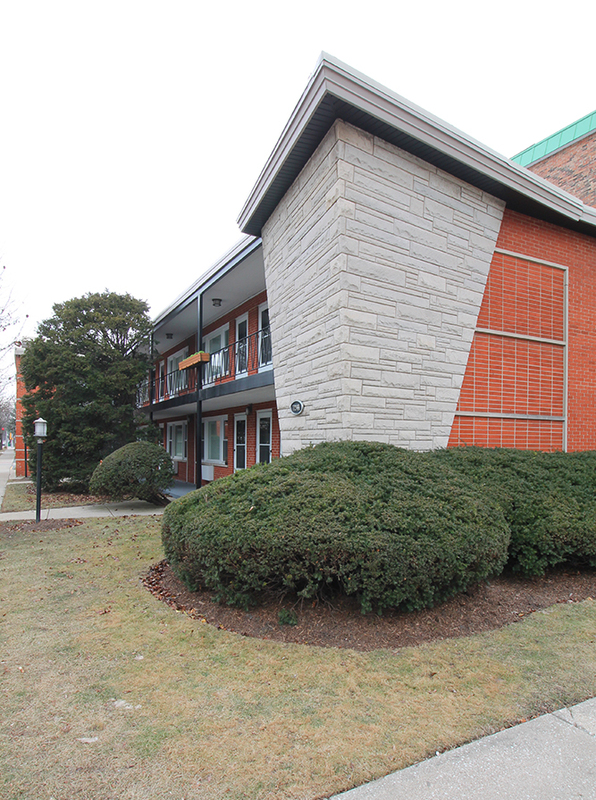 This building is within walking distance of the Green Line and CTA/PACE bus lines. This property features one-bedroom California-style apartments and two-bedroom town homes across the street from the library and blocks from I-290, the Blue Line and vibrant downtown Forest Park. This building provides easy access to I-290 and the Blue Line. This beautiful building is a block from the Blue Line and cozy restaurants of Oak Park Avenue and about two blocks from the Oak Park Conservatory, the Maze Branch of the Oak Park Public Library and the pool and tennis courts at Rehm Park. This apartments in this charming building have remodeled kitchens and bathrooms and offer easy access to public transportation, as the bus that stops in front of the building arrives at the Green Line in minutes. Residents of The Paulina Mansions, as this exquisite 1926 Tudor-revival building is known, are welcomed home by an ornate stone and brick archway that frames a meticulously landscaped courtyard. The Blue Line, Oak Park Conservatory and Rehm Park are all within two blocks. This beautiful courtyard building was built around 1930 and is a Cavalcade of Pride award winner. The Line 91 bus stops in front and the Green Line is about five blocks away. This Tudor building is a block from downtown Oak Park and Austin Gardens and a short walk to the Green Line and Metra.